This pattern issue is related to HBCC-6128 and features the obverse and reverse designs of regular issue double eagles first minted in 1877. 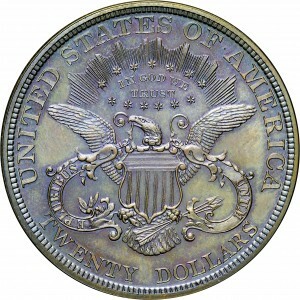 The reverse has the denomination spelled out as TWENTY DOLLARS. This is a rarity, with just four or five examples known in copper and one in gold. This example was incorrectly recorded by Andrew Pollock as his number 1646. From Abner Kreisberg's sale of November 30, 1970, Lot 1345. 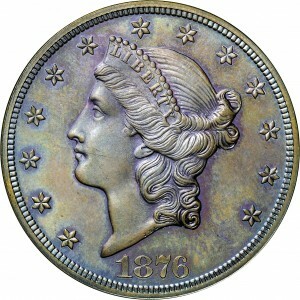 From the slightly modified die which saw use for the regular-issue double eagles of 1877 and later. From the standard die for the regular-issue double eagles of 1877 and later, with the denomination expressed as TWENTY DOLLARS.